Georgia Dunn Studio: A BCN Daily strip: From pencil to print! How the March -July 2017 strips were created! A BCN Daily strip: From pencil to print! How the March -July 2017 strips were created! Edit: Starting July 24, 2017 all of the 'Breaking Cat News' strips are now painted in watercolors again. This is how the strips were done between March 2017 and July 2017. 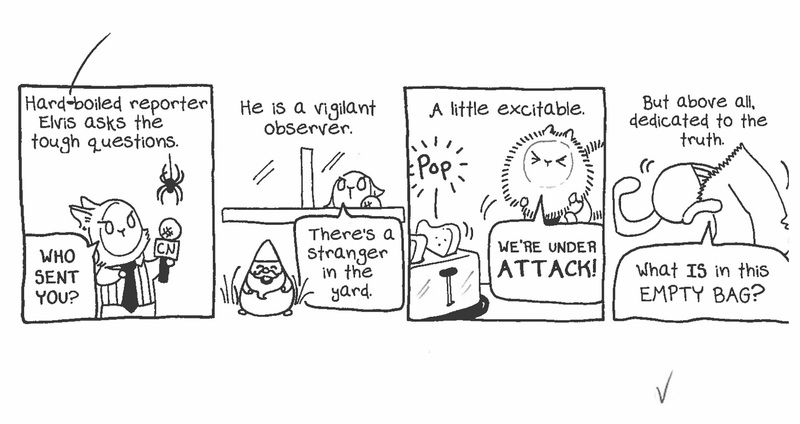 Now that 'Breaking Cat News' is in newspapers, I thought it would be a great time to show how one of the daily strips comes together! In the funny pages, there are "dailies" and "Sundays." Dailies are just what they sound like, strips that run Monday-Saturday. Sundays are exactly what they sound like; they're strips that run on Sundays and they're usually longer than dailies. Traditionally, dailies have been in black and white and Sundays have been in color. A few of my favorite cartoonists, most notably Bill Watterson, hand painted their Sundays. Growing up in the 80s (I was born in 1981) this is how I saw most comics. Sundays felt really special. When the time came to decide how 'Breaking Cat News' was going to make the jump to newsprint, I requested to paint my Sundays. I take a lot of pride in picking up that brush to paint every Sunday. Right now I ink my dailies in black and white, and paint my Sundays in watercolors. That's what I hand in to my editor on Friday afternoons, at the end of my work week. Six inked dailies, and one Sunday painted in watercolors. Most newspapers still print their daily comics in black and white. Readers see BCN very close to how it appears when I put my pen down. Minus the font I made using my handwriting; I type that out in the bubbles before I hand them in. (The font you see is actually my eight or ninth attempt at the font! Tweaking those little letters to get them just right is addictive!) Some newspapers print in color now, and so a great colorist at my syndicate--Universal Uclick (GoComics!) --colors my inked dailies for those papers. She knows the difference when it comes to what will print correctly and not better than I do. I could have learned digital coloring and done an amateurish "new to digital coloring" job, or trusted a long time professional colorist who colors many of the comics we see and love everyday... And I admit--It was really hard for me at first to do that at first! I worried about that more than anything else when we were developing the strip for newspapers--Until I saw the finished strips and breathed a huge sigh of relief and loved them so much. I have a lot of gratitude to the GoComics' colorist, I love what she has done! We've worked together to create a palette of colors for the BCN dailies, so the apartment looks familiar to long time readers. The colorized versions are distributed where you see the comic online, too. That's why the dailies look a little different online and in papers that print in color. When it comes to the Sundays, not a lot has changed from the 'Our IX Lives' Christmas special to now. They will look like that. Right now, I draw the Sundays on paper, ink them, scan them, and then paint them. Then I scan them again, and lay the first inked scan over the painted scan digitally. This is so the lines will be dark and sharp enough for print. Believe it or not, until this past August, I drew the comic in sepia colored inks! (Look back--yes, I did). Drawing it in black ink and adding a layer that is just the inked lines has given the comic much of its new look. Here is a peek at how a strip comes together! 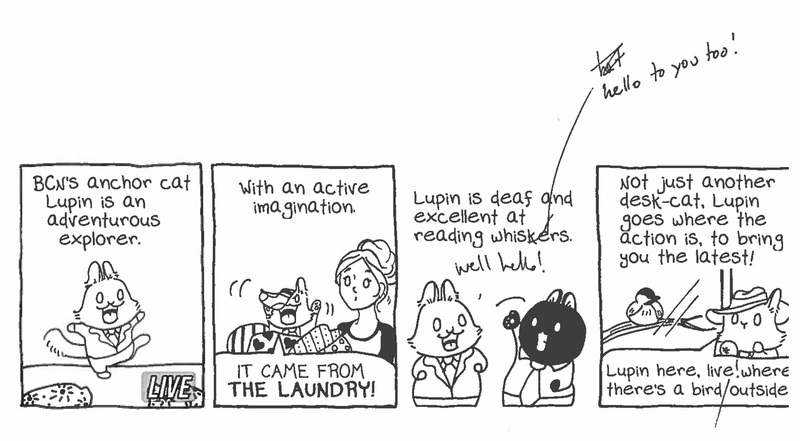 I'll use Lupin's introduction as an example! To really see the beginning, I should be posting shots of my notes, but I can't do that without giving away some of the other strips. I keep a few notebooks around me, in my purse, in my pencil bag, on my nightstand, etc, and I scribble down ideas for headlines all the time. It might be an entire headline, or an observation about cat behavior, or just one random line of silly dialogue. When the time comes to write a new strip, I read through my arsenal of ideas, and pick one out. Next, I do a pencil sketch of a strip. My pencil sketches are usually very close to a finished strip, because I lay out my boxes, bubbles, and text at this time too. Sometimes I mark a little box that says "live," and other times (like this time) I paste the "live" box on before I send it in. I keep a working file of all the BCN station identifiers, and add them to panels the way Burt might for a broadcast. The penciling can be the longest part of my process, because this is when I do most of my writing. Lines change, poses need to be tweaked or tried differently a few times. Drawing is part of writing for me too. I might not write words like "excited" or "anxious;" instead I tell the story by making Lupin's ears leap straight up or Elvis' plaster back against his head. I'm writing the comic with words, gestures, the way a character stands, the clothes they're wearing, the time of day, etc--I write in pictures, and every inch of each panel needs to pack a thousand words. Now that I have a penciled strip, it's time to send a quick scan to my editor! I usually wait until I have all six strips for the week written out. She looks them over, makes notes, and passes them on for one more look. I'm very proud to say, I don't get too many big notes! Sometimes my punctuation could be a little better though, and sometimes a suggestion is made to make a joke or a movement more clear. The big changes everyone feared are not coming. As time goes on, and I weave in more and more, (the same as in the original run) the strip will become more detailed and more nuanced (...the same as in the original run. Can you imagine if this had been the first strip, instead of this? I have to build the world back up, or nothing will make any sense!) My editor reached out to me originally because she was a fan of BCN too, and she knows the characters as well as any fan (also, can we all take a moment to appreciate what an awesome job that must be to have?) She has recently met the boys in real life, too! She loves this comic as it is, that's why she went to bat for us to get it into newspapers in the first place. I look over the notes, and we talk about them. Most of the time, I agree with the notes, they're usually very solid, as you can see above! Now it's time to ink! I ink this strip, along with five others from its batch, and hand them all in! For newspapers that print in black and white--and for me,--the strip is done and on its way! For newspapers that print their dailies in color, the process continues! I mentioned that I created a palette of colors for 'Breaking Cat News' and the colorist works with those colors. Most of the time this turns out GREAT! It's fun to look at the first tests, though, when a few things came out just a little different. This was one of the very first colorized strips I saw. My notes for this strip were that the couch is red and Lupin's pants and hat are the same color as his suit jacket. Lupin looks dapper in a little grey hat--but then the Indiana Jones jokes would be lost later. 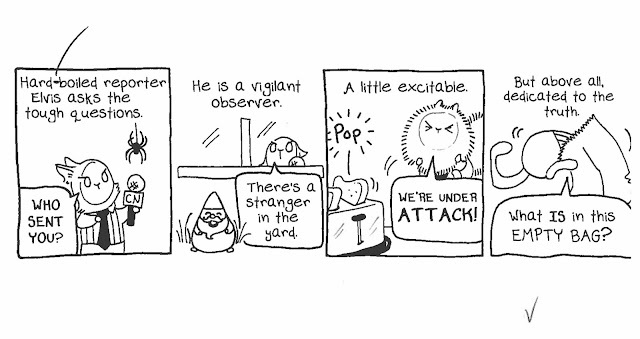 This batch of strips lead me to realize (because I had never quite put this thought into words before!) that the clothes and objects in the apartment are usually the same, with their own set look. I think this has always added to the feeling that the apartment in BCN is a familiar, friendly place to visit. The big red couch, the green rimmed oval mirror in the bathroom, the grey flowered bedspread, the kitchen counter tops, the yellow fuzzy blanket, the "fancy" bowls that come out for potato salad on the 4th of July and mashed potatoes on Thanksgiving, the white laundry basket--You can see them in the background of many strips, even when they don't play a part. This began because many of these objects are actually real or at least based on real objects in our home. I wouldn't go as far as to say the People in BCN are poor, but there are limited resources in their home. Headlines like, "There's a new scratching post in the living room," or "there's a new picture on the wall," wouldn't be as exciting if the backgrounds had an endless rotation of random lamps and pictures. It's new for everyone. Even the boys each have a small, unchanging wardrobe. They all have their own pajamas, fitness attire for "the bi-monthly 2am running of the cats", and nice suits. On Thanksgiving they dress a little more casually, and we get glimpses into their personal off camera styles. Limited resources is the key here, though. Everyone in the apartment, cat and human alike, are all making due with what is available, and I think it makes the setting feel more cozy and like a real home for readers. These were hundreds of decisions I made subconsciously, and never examined until it was time to bring a colorist in. Getting to think about the setting and why it looks the way it does was interesting, and I think it tightened up the look even more. The window frames are brown, the outside window frames on the Big Pink House (which the BCN family and crew will move into soon!) are green. The carpet is blue. Most of the walls are white, but the bathroom is light green. Many times long time readers know what room the boys are reporting from, even when they don't say. A lot of comics might just have any color in the background, and it works great, but green would signal "bathroom!" in BCN. If the Big Pink House was suddenly The Big Olive Green House, things would feel off. Deciding to keep the setting and the colors static was important to the storytelling, and having a chance to pause and think "why?" was cool. Working on the color palette was a lot of fun! If you're a cartoonist, you might want to take a night or two and think about what colors you'd like in your comic and if your background is going to shift and change and grow or if it's going to stick to a series of established settings. Here is the revised strip! And that is how the strip appeared online Tuesday on GoComics and in newspapers that print in color! Here are a couple of more strips to look at, from start to finish! Ink (Again, the last line changed during our Skype call). Once I have a published Sunday strip I can share, I'll make a second post on how the Sundays come together. Those are interesting, because many of the first Sundays are actually the first strips from the original run! I'll post comparisons between the two, and the sketching and inking between. There were no notes on the Sundays, they all went in as they had been--BCN classics, finally in newsprint! And so, that's a behind-the-scenes peek at how daily strips come together! Now that I've written one of these posts, I'll try to remember to follow a strip from actual notes in a notebook to this point. I hope you enjoyed seeing some of the process! This is all so interesting...thanks for sharing so much about the process! This is really, REALLY cool! I am glad that your beautiful watercolours are still going to be out there for Sunday! So neat to see strips from start to finish! Thanks for sharing! This is so awesome! Thanks for the behind the scenes look! It's nice to go "behind the scenes" and see how things work. Thanks Georgia and again...great job!! Wow, this is so cool! Thanks for sharing the process! A wonderful write-up and fun to see the process. Thanks!